The first major festival of contemporary Chinese culture – CHINA HEUTE - was planned to take place in Munich in 1996 from June 10th to 28th. Chinese artists from each art form - theatre, music, dance, the fine arts and photography - were to represent current cultural developments in emerging China. This project was set up in conjunction with the Free State of Bavaria, the provincial capital Munich, the Goethe Institute, the Beck Forum and other partners. Due to political disagreements however, it was unfortunately not possible to present the whole programme, but only a large exhibition of contemporary fine arts. The considerable response it met with was an indication of how great the public need is for up-to-date information. The BAYERISCHE KULTURTAGE, marking the ten-year relationship between Bavaria and Shandong in Jinan and Qingdao, took place in the autumn and winter of 1997, and the guest performances in Wuxi and Shanghai were continued. Highly successful were the Bayerisches Staatsschauspiel with "FRÄULEIN JULIE", the Münchner Kammerorchester under the baton of Christoph Poppen, the Tanzforum München with "CARMINA BURANA" and "DIE DAME UND DAS EINHORN", and the E.T.A. Hoffmann Theater Bamberg with "BAMBOLO"; as well as a city installation ("Projektionen"), an exhibition of applied arts and an exhibition of fine arts. Symposiums on the fine arts and architecture featuring German and Chinese participants provided a framework and the opportunity for in-depth exchange. Artists, gallery-owners, art historians, urban planners and architects discussed the current situation in detail. A particular success was the exhibition "Aktuelle Kunst aus Bayern", which was initially presented in Jinan and then taken to the Shanghai Art Museum and the National Gallery in Peking. China holds a celebration in Berlin! 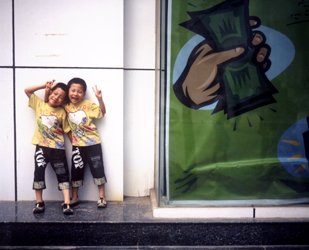 The 2001 “Asien-Pazifik-Wochen” was China's opportunity to present a wide range of first-rate cultural contributions. Culture in dialogue: the focus of the “Asien-Pazifik-Wochen” in that year was upon a country that was in the process of experiencing heady economic and social upheavals - one could use the "Transrapid" as an appropriate symbol. Poised for change, China looked across her rich cultural heritage and marked out her coming identity in the global structure. Who has never heard of the Peking Opera and the Kun Opera? Of shadow theatre, dragon festivals, Gonfu or Chinese hot food stalls? The people of Berlin were able to experience Chinese tradition for themselves - sensuous, colourful and far from familiar, no matter whether highly sophisticated or purely mundane - in theatres and museums and out on the city streets. One of the highlights of the CHINA FEST was without doubt the exhibition of 1000-year-old Buddhist sculptures which had been discovered in the Shandong province in 1996. This was the first time they had been seen outside China, and afterwards they were to remain in the People's Republic. The modern China of today came to Berlin, too. It proved that the "Land der Mitte" is a pivot of international artistic activity. The programme included exhibitions of Chinese photographic art and avantgarde posters, as well as art in the "new medium" of internet. Exciting projects by young Chinese architects - one only needs to think of Shanghai - were highlighted in another special feature. Theatre and dance were also represented: Lin Zhaohua, the director internationally known for his progressive contemporary drama, presented two of his productions, and the Guangdong Modern Dance Company stood for the highest level of experimental dance. An extensive series of films was also shown. "World Music" from China made for interesting musical encounters. 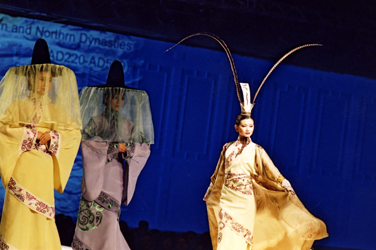 And the fashion show, which brought 1000 years of China to the catwalk, received similar acclaim in Berlin as in Paris and New York. The illuminated streets and squares of Berlin were the backdrop for celebrations, every kind of performance, and for new encounters. In addition, a well-placed LED screen opened a window onto China for the Berlin public: it displayed art projects and documentaries as well as the latest news, and kept everyone up to date on events in the CHINA FEST programs. Berlin's twin city, Peking, participated in the programme with numerous contributions, which were mainly to be seen in the Chinese Garden in Marzahn-Hellersdorf. The Garden as well as its tea house set the scene for a variety of performances, including tea ceremonies, music played on traditional instruments, Chinese sports and acrobatics and presentations of native arts and crafts. Special events, for instance a painting competition, were put on for children, others for senior citizens and for Chinese people living in Berlin. The CHINA FEST was run as a joint project by the Berlin "Senatsverwaltung für Wissenschaft, Forschung und Kultur" and the Bureau of Information of the State Council of the People's Republic of China. On the Berlin side, the project was made possible by substantial sponsorship from the funds of the "Stiftung Deutsche Klassenlotterie Berlin". HAHN PRODUKTION was given the responsibility of seeing the whole project through.